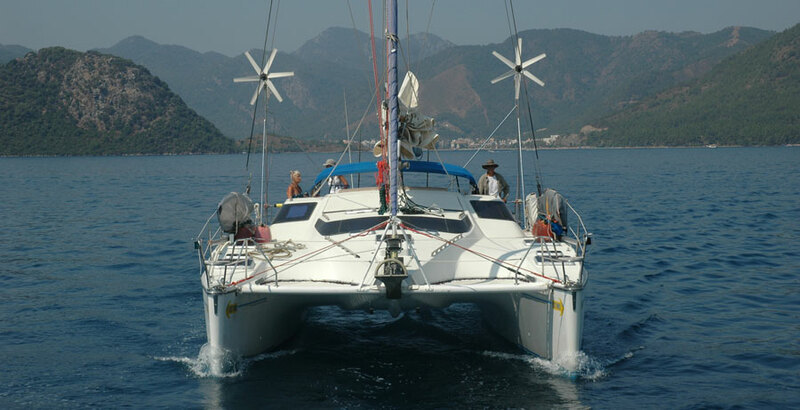 CIRCUMNAVIGATION DVD - TOP TEN CRUISING DISASTER I WAS AFRAID OF THAT NEVER HAPPENED. EXIT ONLY. Before we left Florida to embark on our circumnavigation, I talked to everyone I met who had cruising experience at length and asked a myriad of questions. I read books and articles about what it was like to cruise. We had done a lot of sailing, but we were not blue water cruisers. We are grateful to those people who took time to share their experiences with us and encourage us then. 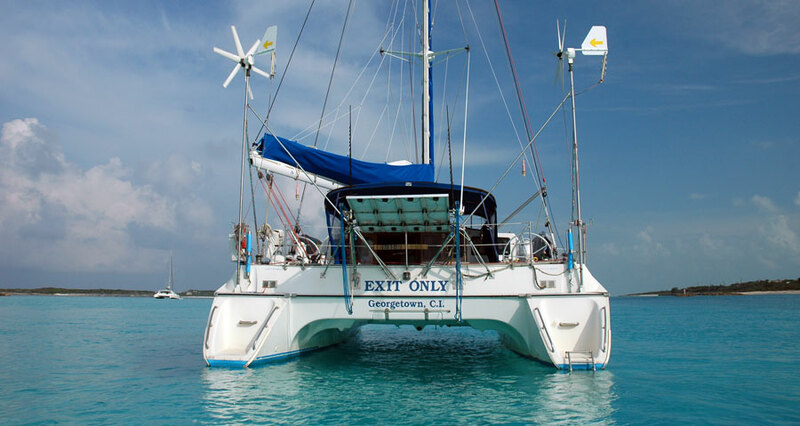 Now, I would like to join their ranks and be a source of information and one of the “encouragers” to everyone who is contemplating going cruising. #1) I WAS AFRAID…I would forget to buy and stock something important, then we would find ourselves at sea without something we needed. WHAT DID WE DO? I made lists and more lists, categorizing all the things I could think of that a family of four would be using in the next few months. 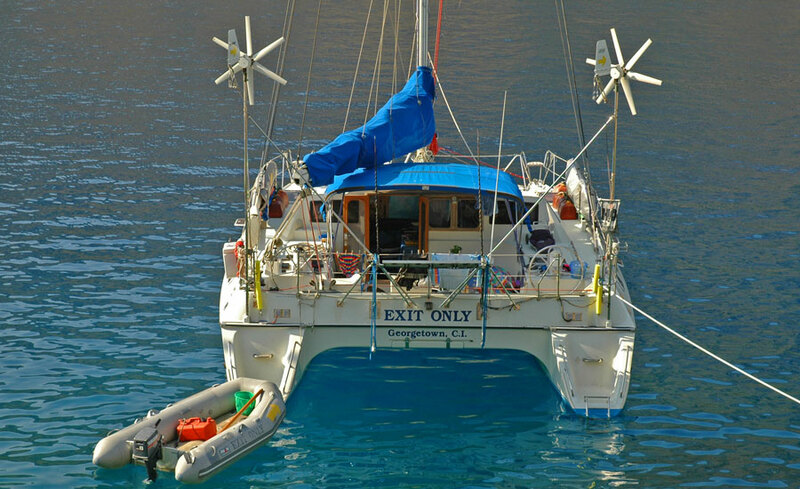 Every nook and cranny aboard EXIT ONLY was filled with something I was sure we would need and I wasn’t sure we could buy “out there”. WHAT REALLY HAPPENED? There are people living almost everywhere you go when you are cruising. Those people eat and use the basic necessities of life everyday. We found food was available everywhere. We found daily basics available everywhere. Now, it may not be the kind of food you are used to eating or choose to eat, but food is available. The basics may not be your favorite brand or exactly what you wish you had, but there is a wide variety of supplies available everywhere you go. WHAT DID WE DO? I do/did get seasick at the beginning of every passage. I have tried several “cures” for seasickness including Sturgeron Forte, the Scopolomine patch, Pahia Bombs from Pahia, New Zealand, the “watch” with electrical pulses, etc. Click on this button to tell your friends about "Top Ten Cruising Disasters That Never Happened". I’m not afraid of snakes...I respect them. In the same way, I’m not afraid of the ocean, but I respect it. When you respect something that is potentially dangerous, you increase the odds of survival if problems happen. At the Siam Snake Show in Phuket, Thailand, I watched a snake handler place his index finger into the mouth of a non-venomous snake. He didn’t get bitten and the snake didn’t seem to mind. 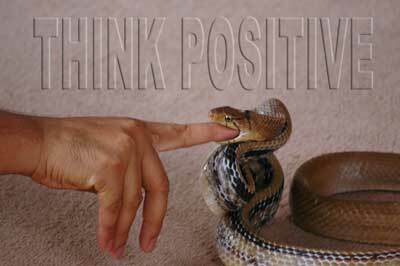 I mustered my courage and placed my index finger in the same snake’s mouth. I must admit, putting a finger in the snake’s mouth took me far outside my comfort zone. Later in the show, the snake handler kissed a lethal King Cobra. This was definitely a Ripley’s Believe It Or Not experience. Not in a thousand years would I have ever expected to see anyone kiss a King Cobra. To me it seemed impossibly dangerous and foolish, but to the cobra handler, it was all in a days work. Now if I had asked the Cobra Kisser to sail my yacht across the Indian Ocean, he probably would have said, “No way mate. It’s simply too dangerous to sail in a small boat across such a big ocean. I’ll stay here at the snake farm where I have financial security and I know that I’ll be safe.” People who kiss cobras don’t know anything about sailing across oceans, and to them sailing the seven seas seems far too dangerous. 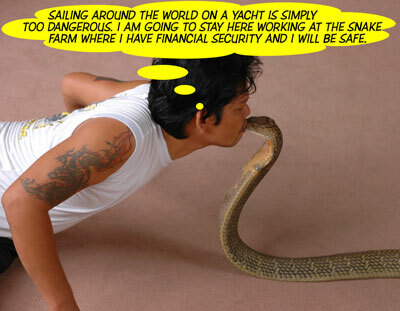 Kissing cobras and sailing across oceans are both exercises in risk management. If you manage risk properly, usually you don’t get hurt. If you don’t take risks seriously, you put yourself in harms way and problems occur. Although they say everyone has a price, no amount of money could induce me to kiss a King Cobra. 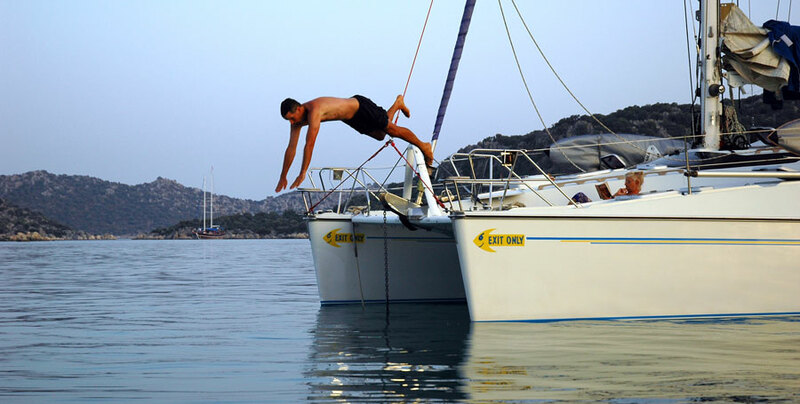 Sailing across the Indian Ocean is a completely different matter. You don’t need to pay me anything to sail the seven seas; I will do it for free once I have done my risk management. Risk management is mostly common sense. Take storms for an example. Only a fool totally ignores the weather and sails directly into the jaws of a tropical cyclone. Cyclones don’t just appear out of the blue. They take time to form, and after they form, they send warning signals to tell you they are there. A cyclone creates large ocean swells that travel hundreds of miles in every direction. If you experience a large ocean swell that is not explained by prevailing wind and weather conditions, you know that there is a big storm in the direction from which the swells originate. The cyclone is sending a warning for five hundred miles in all directions, and if you pay attention to the warning, you will stay out of harms way. That’s the way mariners have avoided tropical cyclones for the past five hundred years. That’s how they did risk management before they had satellite photos and weather fax. We use a lot of technology to do our risk management. Before we make an ocean passage, we check out weather satellite photos of the region where we are heading. If the satellite photo shows bad weather, we don’t go. For the Indian Ocean we go to the internet at www.fnmoc.navy.mil and we look at the infrared satellite photos of the Indian Ocean. Web sites also show wind speed and direction, significant wave height, and weather maps. We don’t rely on a single source of weather information because they may get it wrong. We always consult multiple sources to make sure we are on the right track. Once we head offshore, we contact other boats by high frequency radio to see what the weather is in their area. We also listen to Richard who runs the Southeast Asia Maritime Mobile Net at 0800 at 14323Mhz. Every morning Richard gives the weather for all of Southeast Asia and the North and South Indian Oceans, all the way to the Red Sea. He gives us real time information on the weather in our location so that we know what to expect, and he warns us that we need to head in a different direction when bad weather is ahead. 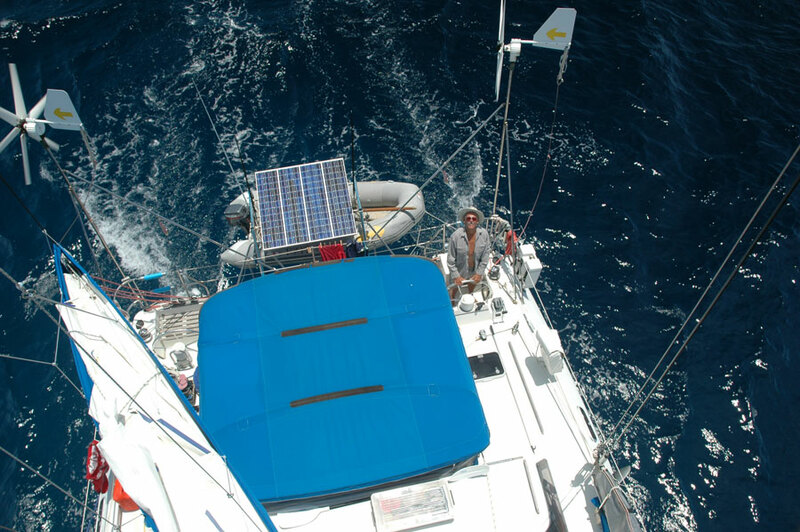 Once a day, Richard sends us an email giving the significant weather in the Indian Ocean. 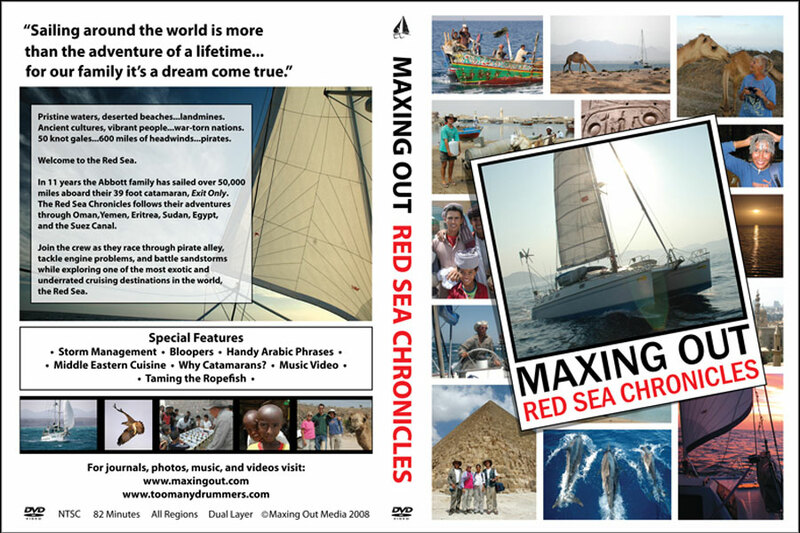 He has grouped all of the boats heading across the Indian Ocean into what he calls, “The Red Sea Gang”, and he supplies everyone with weather by email all the way up the Red Sea. Here in Thailand and Northern Malaysia, there are about a thousand cruising yachts. Several hundred of them will cross the Indian Ocean as soon as Richard gives the green light. When the green light comes on, there will be a mass exodus. Some yachts will do the southern route to South Africa, and others will do the northern route up the Red Sea and into the Mediterranean. No matter which direction they head, all of them will tell you that they would rather sail across the Indian Ocean than kiss a cobra any day. They understand the risks, they manage the risks, and they are willing to do whatever it takes and live with the consequences. That’s as it should be. After all, they are living their dreams.